As a community development practitioner – which is truly what I am – I take this maxim very seriously. In urban communities where population decline has left pockets of poverty and what we have come to call “shrinking cities”, the lack of rooftops is a major challenge. So often, the first step in building a great retail district begins with building rooftops – and the ensuing density and market demand that is ultimately required to support businesses. 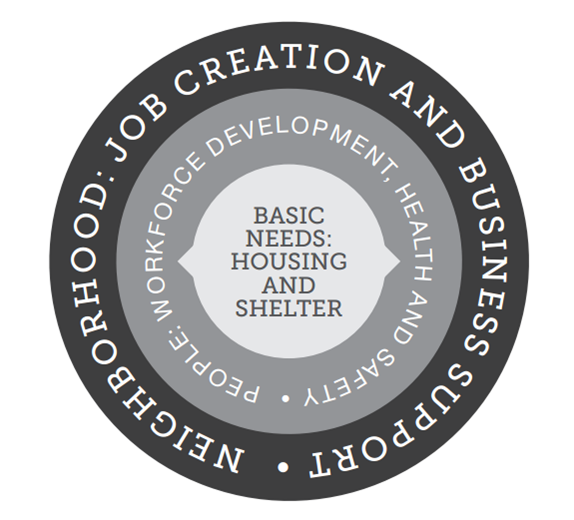 In 2013, the Association for Neighborhood and Housing Development asked our firm to lead an assessment of the economic development activities of community development corporations in New York City. The final report, entitled “Roadmap for Equitable Economic Development” laid out a framework for supporting the natural evolution of the community development industry. More and more, CDCs are building upon their success in housing construction (i.e. those all so important “rooftops”) and expanding their role into a wider variety of community development activities, including small business support, commercial corridor improvement efforts, land use advocacy and workforce training, to name a few. This is truly a natural outgrowth that reflects the success they have had in community building efforts – success that has now positioned many of these groups to take on a new role – improving local commercial corridors and ensuring that residents have access to vital goods and services. But let us not forget that getting there took decades – and the work is far from done. We must ensure that this work remains funded through financial tools that have played an instrumental role in helping to build much needed affordable housing. I share all this because we recently started a project in a challenging urban community in New Jersey. At a forum discussion with local residents it quickly became clear that retail was a concern, but perhaps not a priority. What emerged was a portrait of a deeply troubled community where the complicated issues of poverty, lack of viable job opportunities and rampant crime were first and foremost on people’s minds. One participant shared her experience holding a young boy in her arms after he had been shot and going through two towels to keep him from bleeding out. Her struggles are real. The challenges of her community are real. The fact that loitering at the local bodega might result in an assault, robbery or worse are real. In this kind of environment, local businesses struggle just like everybody else. They often cover window openings – or worse remove them entirely – to prevent being cased by thieves. Local business owners struggle to make ends meet, deferring investments and maintenance that might make them more attractive places to shop. It’s a deadening cycle that can be difficult to break. In the end, these efforts are really about improving the market dynamics of community, which may mean spending 15 years on housing development. So in the beginning, it may not really be about the retail, that might have to come later.